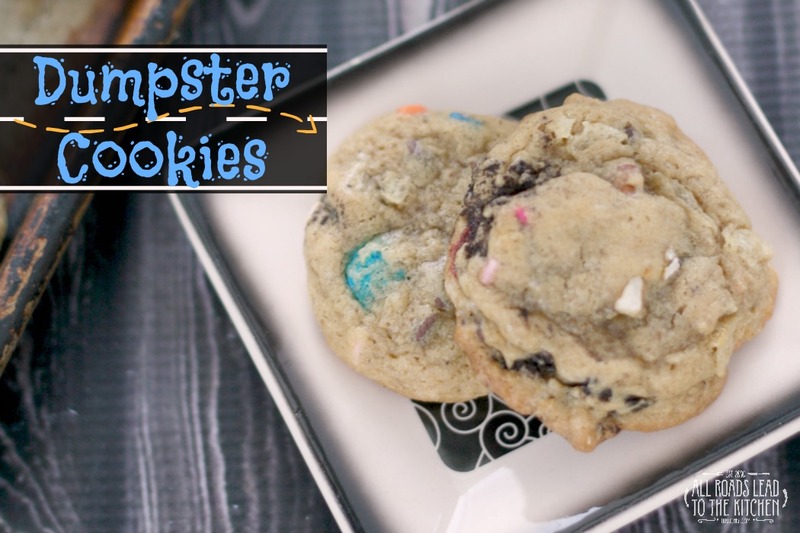 This post has what I consider to be the biggest spoiler from the first half of season 6 of The Walking Dead - so if you don't want to me to ruin it for you, you should go check out these zombie finger cookies instead of these dumpster cookies right away! Okay, so if you're still reading, that means you're all caught up or that you don't care about the best show on television. No judgement. Let's talk dumpsters. Specifically glorious dumpsters that save the life of your (my) favorite character. 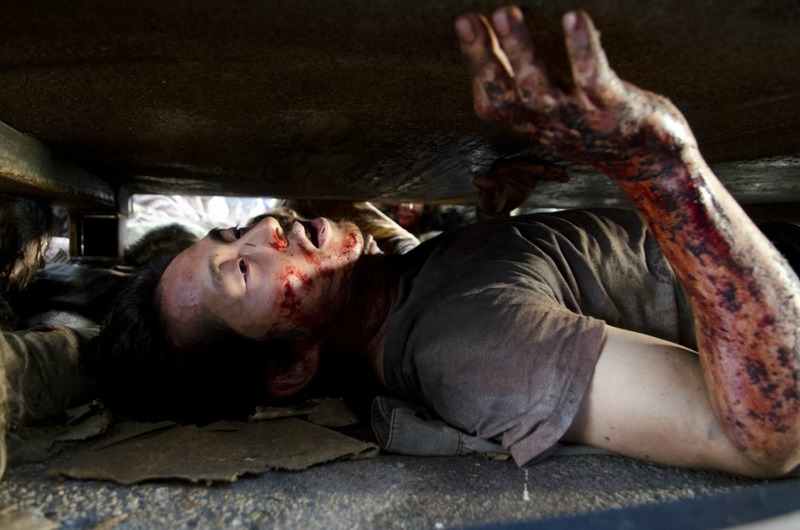 Everybody told me that there was no way Glenn survived that mob, but I held on to the hope that he was still alive. After all, Glenn represents hope lately, and the writers just wouldn't rip all hope out from under us would they? I'm that girl. The one who cries for a solid 25 minutes after it happens. No! No! No! No! And tweets the cursiest of the curse words directed at the writers of the show. Eff you, mother effers! And then still believes that Glenn is really alive. After 5 extremely long weeks filled with opposing theories, I was finally able to scream loud enough to wake the dead. You would have thought my team just won the Super Bowl up in this place. My poor oldest son (he's 18) normally watches it with me, but he was behind a few episodes since he'd just started hitting the sack earlier so that he could get up for morning practice before school. Well, too bad for him. 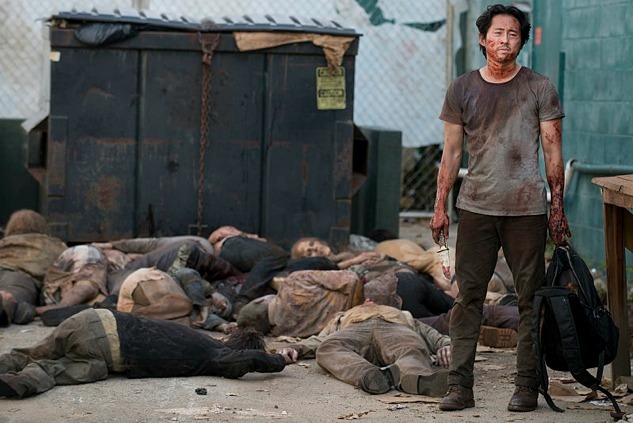 There was no disguising the fact that Glenn was alive thanks to that glorious dumpster. In all fairness, he had plenty of time to catch up...he just hadn't yet. So yeah, I'm celebrating the dumpster, regaining my voice from all that hootin' and hollerin', and apologizing for my heated tweet. 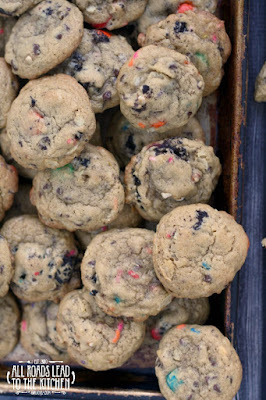 Often known as kitchen sink cookies, trash or garbage cookies, or compost cookies, these little beauties are filled with the leftovers at the bottom of all of the bags in your pantry. Got potato chip crumbs? Throw 'em in. Got pretzels? Throw 'em in. Got random odds and ends of chocolate or butterscotch chips? M & M's or Reese's Pieces? Corn flakes, rice krispies, cheerios? Coconut flakes? You guessed it - throw 'em in! 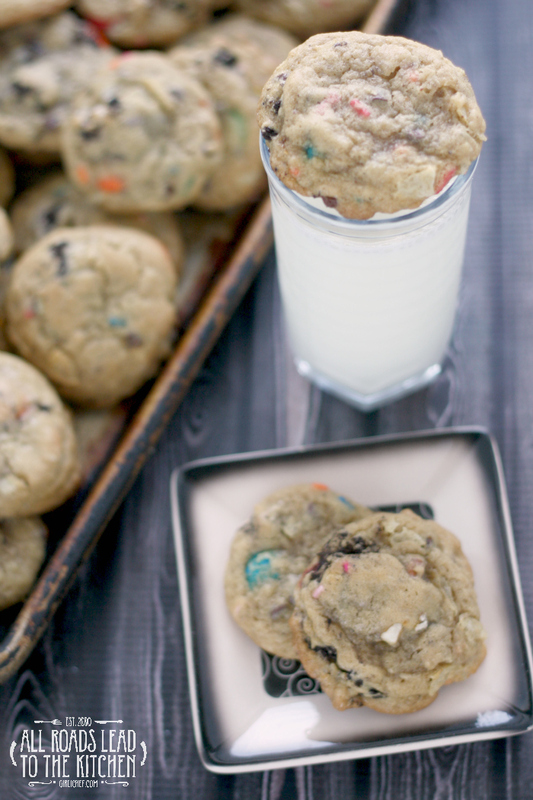 With a cookie base that stays soft for at least 3 days (the last one disappeared on day 3), these cookies are sure to be a favorite of all the cookie lovers in the house. And the name will conjure up happy thoughts. Like dumpsters. 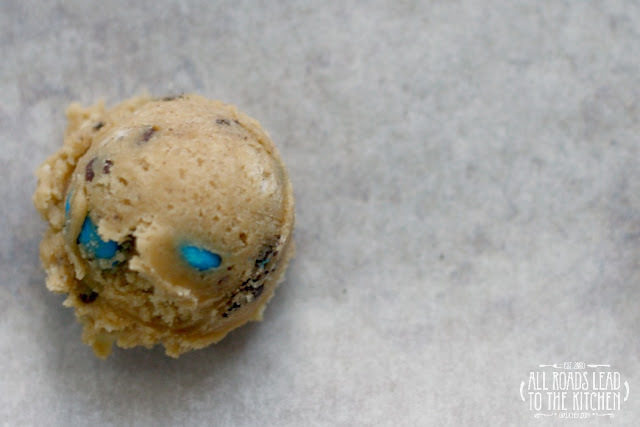 Empty the bottoms of all of your chips, pretzel, cereal, chocolate chips, and candy bags into one batch of delicious, super soft cookie dough. Combine flour, baking soda, and salt in bowl and set aside. In a large mixing bowl, beat the butter and two sugars together until light and creamy. Beat in eggs and vanilla. Add flour mixture and beat gently until just combined. Fold in the add-ins. Cover dough and refrigerate for at least one hour. Preheat oven to 375° F. Line a couple of baking sheets with parchment paper or a silpat. Scoop by rounded tablespoons onto prepared baking sheets. Slide into oven and bake for ~10 minutes, or until just golden around the edges. Remove from oven and let the cookies sit on baking sheet for 1 minute, then transfer to a wire rack to finish cooling.